One of the things we liked about our farm when we bought it was that it was truly off-grid. That means managing our own power, water and sewage. Truly living the eco dream! What we weren’t so excited about was the terrible state of the solar generation system. It hadn’t been serviced in the last decade, meaning the lead-acid batteries had been allowed to go dry, the generator was failing, and the lights dimmed every time the water pump when on. So a brand new PV system was required. Our immediate challenge was finding someone who could sell and install a solar solution. Our farm is located in a rural setting surrounded by rainforest and fields. But it’s also just 10 minutes away from the nearest town, making it semi-urban. The net effect is that very few of the local PV systems are off-grid, and few of the local installers had experience with off-grid setups. We wanted someone nearby to do the work, so we could get good post-installation support. It’s worth highlighting at this point that there are power lines that run across a corner of our property. Connecting to the grid, however, would cost $20-30k, and then we’d have to pay electricity bills. We ended up getting one good quote for a new system, for a total cost of $30k. So the same up-front cost, but with a lifetime of free power. That was an easy decision. It took the team three days to strip out the old system and to install the new one. Right from the beginning it’s been working well, and getting enough sun even in mid-winter (where the sun hits the panels at 11am, until 3pm when the sun dips behind the mountain). The new lead-carbon batteries, quite a difference from the old monster batteries! The general rule of thumb for off-grid is to have 3 days of usage in the batteries, to cover off the occasional rainy week. The generator has been configured to kick in if the batteries reach 30% of capacity, and to then take them back up to 70%. We didn’t use lithium-ion batteries (like the Tesla Powerwall) because they’re not yet designed for off-grid, and the price is still too high. The system operates as a “local grid”, allowing me to re-install the old PV panels on the new shed, connect them to a small inverter, and then just to wire that into the grid. T’he Sunny Island then manages the load across the system as a whole, which is a very elegant solution. It’s early days for our solar setup, and we’ll report back as the months unfold. This entry was posted in Lewisham farm, Saving the environment and tagged solar panels, solar power. As part of our new solar panels, we needed new electricity meters. In particular, a new meter was required to measure the “gross feed in tariff”, that is, the amount of electricity we produce and sell to the grid. The old electricity is shown above; clearly it’s pretty old. I wasn’t unhappy to see it go. This is the new electricity meter. It’s digital, and is able to separately measure both the electricity we use, and the amount that the solar panels produce. Unfortunately it’s not the easiest thing to read and, most disturbingly, the Energy Australia installer had no idea of how it worked. So I guess it’s working OK, but it’s hard to tell. Getting new meter wasn’t simple, and it’s yet another complexity involved in installing solar panels. Firstly, most solar panel companies aren’t able to install the meters themselves, as electricians need special certification to do the work, and the energy companies aren’t in a hurry to give it out. 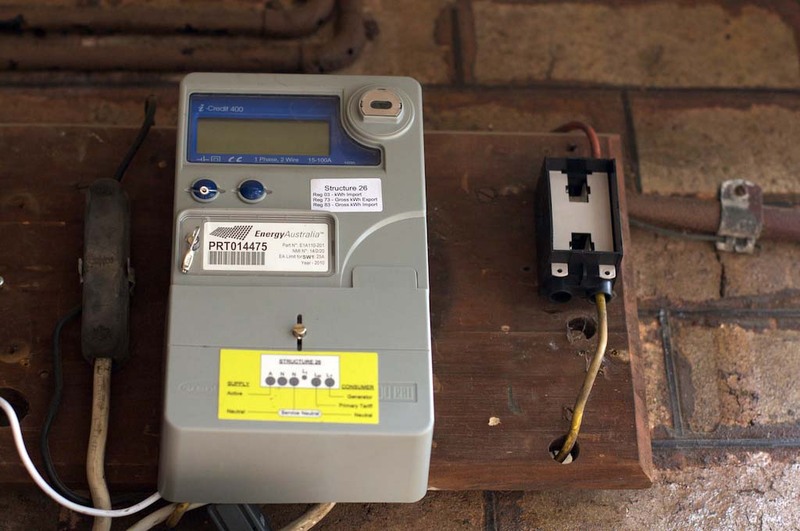 So you’re likely to have to wait for the energy company to install the new meter. And wait you will. We waited quite a few weeks, and then had to make a few phone calls to actually get the contractor to turn up. If our solar power company wasn’t using their contacts behind the scenes, I fear the wait would’ve been even longer. 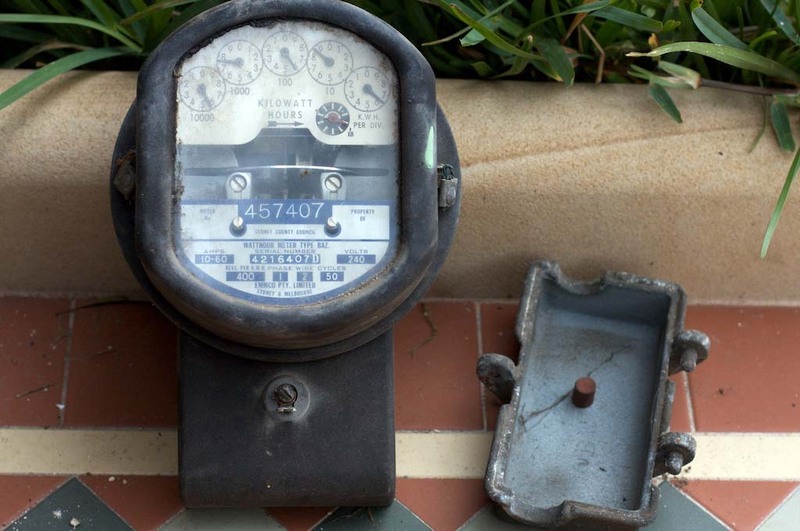 Tip: check carefully when and how the new meter(s) will be installed. Double-check any claims that the solar panel company can do this. If not, ensure that they are ready and able to push through the installation, via back-channels with the energy company if needed. Otherwise you could end up in limbo, with panels producing power but no money. This entry was posted in Saving the environment and tagged electricity meters, solar panels, solar power. Catching up on my backlog of posts, this is the next in a series of entries on our new solar panels, following on from our initial decision. The first step of the installation process is to put up a pair of “rails” that the solar panels are attached to. With a corrugated iron roof, this is pretty straightforward. The existing screws that hold on the roof are removed, and the new screws put in for both rails and roof. Thankfully ropes were used at this point, so I didn’t have workmen falling into the garden. Installing the panels themselves is then surprisingly quick. They simply connect to the rails, and are plugged together in series. Even including getting the panels up on the roof, they were all installed in under an hour. Afterwards, the electrician came by and installed the inverter, which converts DC energy from the panel into AC that can be used. Everything was then cabled together. While in theory there was space for two rows of solar panels, in practice, it’s limited by the location of the screw holes (and underlying beams). In this case, there was only row of screws that could be used for the panels. Finding a the right location for the inverter is important. Apparently they drop in efficiency when they get too hot, so they need to be placed somewhere in the shade. There wasn’t space on the main meter board, but there wasn’t a hassle in mounting it to the side of the house, some distance away. Like all work done on the house, it’s worth double-checking that the panels being installed are the ones that were ordered (there’s a model number on the back of each panel). No problems in this case, thankfully! The slow bit is getting the energy company to install the new meters that are required (but this is the topic of another post). Even without the meters, the energy can be used in the house. It was great to see the meter running backwards when the sun was shining! This entry was posted in Renovating the house, Saving the environment and tagged solar panels, solar power.